You purchased a new home, selected your colours and now you’re ready to start packing! There are a lot of things to do between now and moving day so take the time to prepare. Contact a reputable moving company a minimum of two months prior to your move and go over all details, such as costs and availability. Contact your lawyer to confirm where and when your keys are being picked up. If necessary, arrange for daycare or pet sitting services on moving day. Arrange insurance for your new home. Set up accounts at a nearby bank. Take inventory of your belongings before they’re packed, in the event you need to file an insurance claim later. If possible, take pictures or videotape your belongings. Record the serial numbers of your electronic equipment. Start using up food items in your current home so that there is less to pack and possibly spoil. Register your children at their new schools and arrange for necessary daycare. Locate all hospitals, police stations, veterinarian, fire stations and any other amenities in your new neighbourhood. Familiarize yourself with street parking by-laws in your new neighbourhood. Arrangements will be made for the transfer of your utility accounts (Water, Hydro, and Gas). You must call the utility companies personally to set up the accounts in your name, approximately 2 weeks prior to your closing date. You can arrange hook-ups for cable and telephone after closing. Fill out a change of address card for the post office and let your family and friends know your new address and phone number. Inform all newspaper and magazine deliveries of your new address. Inform all companies you deal with of the address change (e.g. credit cards, phone bill, etc.). Renew your driver’s license and auto registration with your new address. Double-check all closets, drawers, shelves, attic and garage to ensure they are empty. Carry important documents, money and jewelry with you. 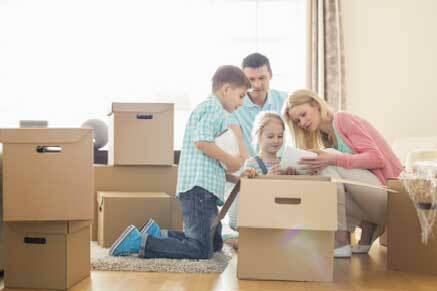 Pack toys, games or special items for the kids to keep them busy during the move. Remember to pack a box of basics that you may need on move-in day (tools, paper products, all-purpose household cleaners, toiletries etc.). Be sure to have it loaded last so that it will be first off at your new home. Pack medicines in a leak-proof container.